Ask any thru-hiker about cravings and you will get an answer in one of two categories. The first will most likely be some food item that they are jonesing for and the second will be some creature comfort like a long and hot shower. Recently, a good friend of ours was asking about our cravings while we have been on the PCT, though she was really referring to food cravings. Early in our hike through what we jokingly called our tour of Washington ski resorts, my family met us at our resupply points. They brought our resupply box but also came with fresh fruit, juice, sandwiches, and other goodies to take on-trail like cheddar cheese, carrots, kale, and tortillas. With this luxurious access to fresh food over the first few weeks, we didn't really have many cravings. Now we are two months and around 1200 miles into our hike. I am craving salt and pepper potato chips and yoghurt (not to worry, not at the same time). Huckleberry is craving dill pickles, which, until she mentioned them I didn't even think about but now can't get them out of my mind. Sometimes near the end of a long hiking day we concoct "dream menus" to distract ourselves. The menus have rotating items and may involve generic items, home-cooked favorites, or specific dishes from eateries we normally frequent near our home. A few weeks ago we both couldn't stop thinking about nachos, though they are not currently at the top of our list. On Day 59 my real-time dream menu is thick yoghurt w/fresh fruit and granola & avocado toast for brekkie, a caprese sandwich for lunch, and the Saigon salmon sandwich from a favorite restaurant for dinner. Huckleberry recommended Strauss soft serve ice cream with olive oil & sea salt for dessert, and I'd take her up on that in a heartbeat. It is amazing how just thinking about food can help out on these long days. Under comforts a hot shower is always at the top of my list. Feeling clean is pretty great, and hot showers are an infrequent luxury on-trail. During and average backpacking trip, we have an opportunity to go swimming almost daily. When you can't have a shower, a swim in a mountain lake is a pretty good substitute. So far on the trail, we have only been able to go swimming a single time, and we often dry-camp with no water source nearby. The water we carry is precious and used for cooking and drinking, so we spare only a tiny bit to wipe the worst of the grime from ourselves before sliding into our sleeping bags. I wouldn't have imagined how much I'd want a shower on the trail, or how different it would be from our habitual backpacking trips in this regard. Fortunately, many friends and family of friends have opened their homes to us and provided the creature comforts of hot showers, home-cooked food, laundry and a bed. We have also stayed at a few motels, a lodge, and a wonderful zen monastery. In between we've had a few short coin-operated showers and the campground at Castle Crags state park had quarter-free, unlimited, hot water showers, a total bonus when you consider the $3/night fee for PCT hikers! We will be stopping for a zero day near Chester soon and during our stay with Huckleberry's parents I am sure that many of our cravings will be fulfilled. Mt. Shasta emerging from the smoke. We have seen Mt. Shasta since before reaching Ashland, and the trail has taken us on a wide circumnavigation of the mountain over about 200 miles. Now we are basically under this iconic peak and ironically can often not see it due to smoke from the Gap Fire. When we left Castella early morning on Day 59 through the thick smoky haze, we climbed up the steep forested slopes of the state park. After leaving the park's boundaries we started to pass huge swaths of clear cut forest on dusty logging roads and on adjacent slopes. With the thick lingering smoke and scarred earth, it felt like walking through a scene from a post-apocalyptic Sci-Fi flick. I was in a somber and reflective mood and seeing Shasta above the smoke triggered memories of the art from my youth. It brought me back to a discussion that Huckleberry and I had a few weeks ago, when she asked how I got interested in the outdoors and the mountains. At the time, I could not recall a particular inspiration but seeing Shasta over the past few days I had a small epiphany. Growing up in a Chinese-Australian household, we had a lot of Chinese art on the walls including several mountain scenes. In the calligraphy style there were delicate and muted outlines of mountains, clouds, and birds. I think these must have permeated into my subconsciousness and became something I later sought in real life. The tall trees on our steep slopes that morning framed narrow vertical glimpses of the mountain rising above the haze and these windows brought me back to the calligraphic art. Certainly our views were not the ethereal and idyllic mountain images of those scrolls, but the indistinct outline of the mountain and the narrowly framed views bore a close-enough resemblance for me. I dabbled with Scouts and took some overnight camping trips as a kid, but had no backpacking experience until college and the early post-college years. My most extensive trips were canoe camping as part of college orientation and two service trips with the Sierra Club doing trail work in Rainier and Crater Lake National Parks. When I met Huckleberry we started with car camping and graduated to longer and more remote backpacking trips and I was hooked. Huckleberry on the bridge over Squaw Valley Creek. Sunset over the McCloud River Valley. We took an early lunch break at the top of our long climb, then started to drop on the far side of the slope. The air still had a faint haze but the smoke was much diminished on this side. The rest of Day 59 took us through unmarred terrain, with deeply forested slopes alternating with exposed and dry terrain. The former was dominated by Douglas fir, some attaining 36-40" diameter. On the far side of deep and green Squaw Valley Creek the sun-drenched hillside supported a few smaller Douglas firs but the primary species were oaks and manzanitas. We progressed along the slopes and as dusk fell we found ourselves hiking above the thunderous flow of the mighty McCloud River. We occasionally had a view of its pale aqua waters tumbling over huge boulders, but it was generally a few hundred feet below us and our views were filtered by thick forest. We approached Ash Camp as twilight fell, planning to spend the night but unsure what we'd find in this spot with dirt road access on the Friday of Labor Day weekend. Would there be throngs of folks or would the smoke keep them away? As we approached with our headlamps on, we could see many lights though the trees and smelled barbecue. We arrived to find most of the sites full with large groups of car campers complete with huge tents, portable canopies and accessory tables, ice chests, and jugs of water. We quickly set up camp in one of the few remaining sites, gathered our water from the river, had a late dinner in the tent, and made plans for an early start. Fortunately the noise died down just as we were getting ready for bed ourselves. Large green foliage along the creeks on the shaded slope up to Grizzly Peak. Looking back at Grizzly Peak from the manzanita covered ridge. On Day 60 we got up early and in true thru-hiker style were out of camp and on-trail before any of the other campers were even stirring. We had a string of high-mileage days planned to position us for the upcoming Hat Creek Rim, and today's total climb of ~7000' would be similar to yesterday's. We started with a long but gradual climb from the McCloud River up forested slopes and appreciated both the protective shade from the dense canopy and the cool air around several cold streams surrounded by lush greenery. We were also happy to be away from both the haze and smell of smoke. We made good progress and by late morning broke out of the forest near the summit of Grizzly Peak onto a ridgeline of stunning rock formations and covered by manzanitas. Manzanita berries aplenty along the trails. The mysteriously brilliant red leaves, new growth on a mazanita. We could see the trail carving a beige line high across adjacent slopes as far as the eye could see. In the distance were several small mountains and beyond them to the south was our next major landmark, Mt. Lassen. With the sun high in the sky, we were soon hiking across dusty dry soil surrounded by various hued rock jutting dramatically from the hillside and numerous types of manzanita, all loaded with berries. The fruit varied in color from cream to red to nearly black. Manzanita was the dominant species for miles. We lamented that we didn't know whether the berries were edible, although we soon saw scatologic evidence that some of the local denizens were certainly eating them. I am certain that most west coasters can identify a manzanita shrub or tree. They have distinctive peeling red to mahogany bark and dry stiff evergreen leaves, and thrive in drier environments. I have since learned that these plants shed their paper-thin bark yearly as it grows much like the lizards that inhabit the same climates. There are over 100 species of manzanita and 95 of them are native to California. We also saw several of them with stalks of bright red growth that left us stumped. It was only on some plants in certain exposures so we were trying to figure out whether it was new growth, an atypical bloom, an epiphyte, or some disease. At one of our snack breaks, I took advantage of cell service and Google and learned that some species have new growth of dramatically bright red or coral color. Question answered. Fun fact: The name Mazanita derives from Spanish and arose during the early Spanish colonization of California. The fruits on these plants resembled small apples "mazanas" so the species is named "Mazanita" or little apple. Mazanita with its characteristic peeling bark. Gooseberries are not user friendly. While we crossed this ridge we saw heaps of bear prints along the dusty trail. There were so many bear tracks that Huckleberry would start joking here's a NOBO bear or this one is SOBO. Thankfully, we did not see any bears in person as we would not want to disturb one feasting on berries and feeling defensive. 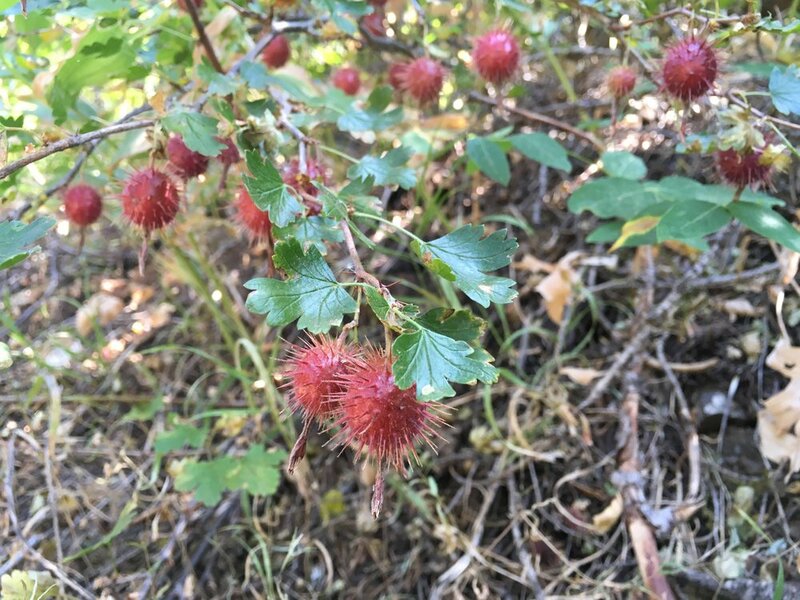 There were tons of other types of berries, including the spiky gooseberry, but sadly no edible types since that small patch of huckleberry in the Marble Mountains. We have been suffering withdrawal from natural trail snacks since then and know the odds of seeing any as we continue south are slim. We have learned that while mazanita berries are edible the berries are bitter with thick skin and large seeds and best left to the critters, Gooseberries look like some torture device left over from the Spanish Inquisition, and the other berries are on plants we have no clue what they are or have cautionary names like baneberry. Although we can't eat them, the proliferation of berries is yet another reminder that the seasons are turning and autumn is fast approaching. 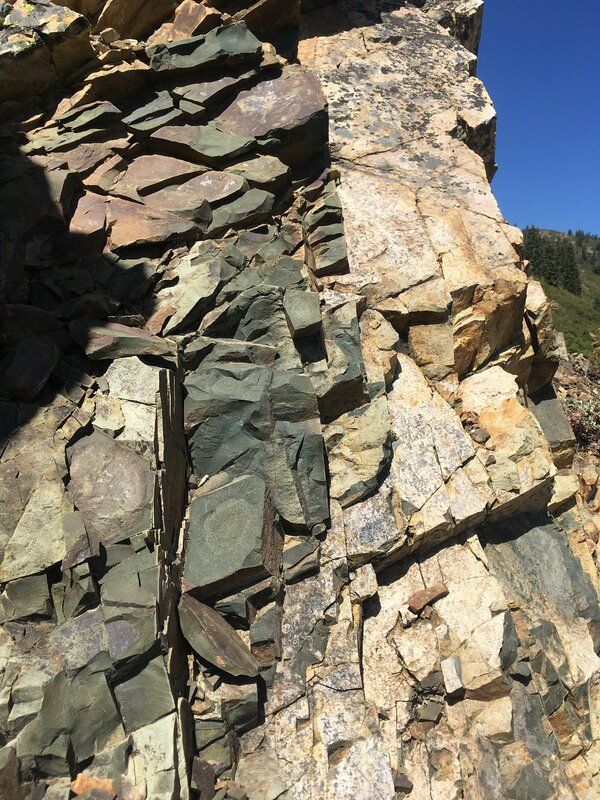 Vibrantly hued rock along the trail. Rock formations erupting from the hillside. As the season progresses and we pass through more arid landscapes, we are paying more attention to the water report. 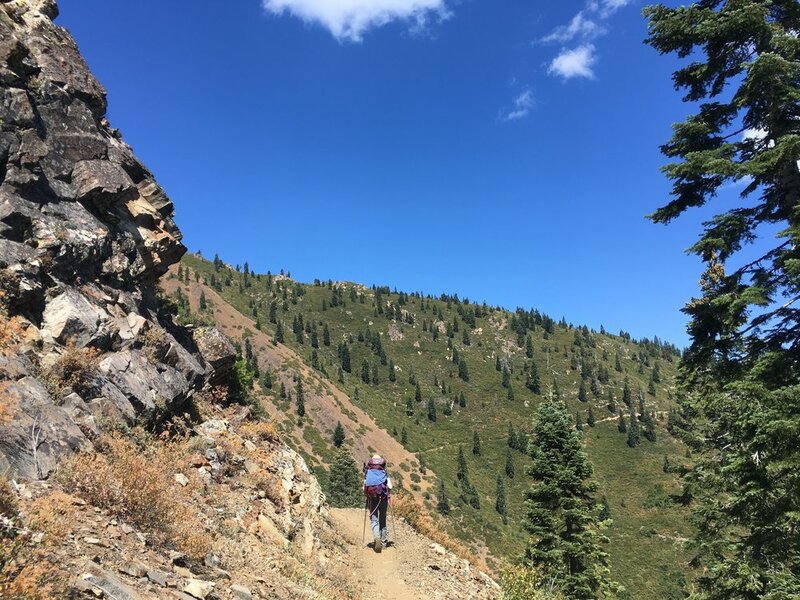 This great resource for PCT hikers is a database that is maintained through the hiking season by two previous thru-hikers who volunteer their time. Current hikers email or text updates on the quality and flow of on-trail water sources, and we keep the most current version loaded on our phones to refer to as we plan our days. Many water sources are dry or barely a trickle at this time of year, and this information is invaluable when the next source may be 5-10 miles away. We have found that the most recent information for northern CA is 4-8 weeks old so we are sending updates as we hike to assist those behind us. Many seasonal streams and creeks that were reported to have water in mid-July are dry or nearly dry now. We have not been seriously affected by reaching a source that we wanted to use to find it dry, but we are still acutely aware of that possibility. We have come across some creeks that were reported to have flow of >10L/minute a month ago, but are now barely a trickle. We find ourselves planning much more carefully than we did even just a few weeks ago. Much like the water flow in a seasonal stream, the number of NOBO hikers has dropped off dramatically and nearly dried up. At the peak we were seeing 80-100 per day. Two weeks ago we saw only 15-20 per day and doing the math realized they were cutting it close if they hoped to reach Canada before the snow started falling in the Northern Cascades. Those hikers still expressed confidence in their ability to make it, despite the odds. Now we see only 1 or 2 NOBOs per day, who openly concede that there is really no chance of them completing the trail this year. We planned just over 30 miles for Day 60 to camp and eat near Kosk Spring, but by mid-afternoon we revisited our options. Long miles and plenty of elevation change are hard work, and we still have two long days ahead of us due to the Hat Creek Rim approaching. We decided to have dinner at Moosehead Creek, the last reliable water source, and camp a few miles short of Kosk Spring to allow for a little extra sleep tonight in the middle of our four long days. The campsites near Moosehead Creek were really sweet and quite tempting, but we packed up as planned after eating and hit the trail again. We ran into a NOBO jus as we were leaving, our first of the day. Each time we see one now, we wonder if it will be the last. We hiked the last 8 miles to our camp at an unnamed saddle, the last hour by headlamp. We traversed several steep sandy slopes with patches of sedimentary rock as we made our final approach and set up our tent in a patch of bare sand, giving rise to our moniker for the spot. Off to sleep now, to rejuvenate for the long and dry days ahead.